In case you aren’t keeping track, it’s 16 days until Halloween, 37 days until Thanksgiving, and 71 days until Christmas. And because I live that crazy blogger life, I’ll be breaking out the Christmas decor in a week or so. But before that happens, I figure I should show you our Halloween decorations. 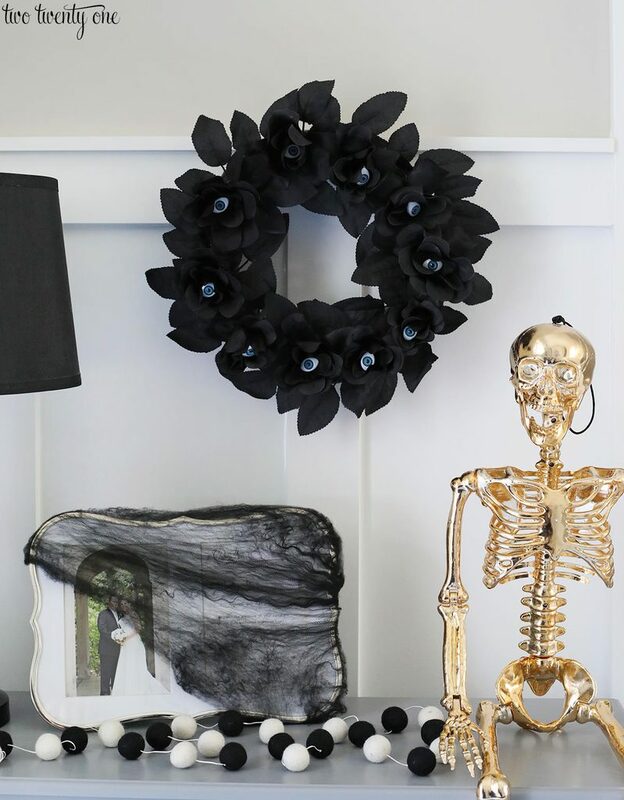 I’ve teamed up with some great bloggers for a Halloween Home Tour, so if you’re stopping by from Monica Wants It, come on in! I never tend to go all out for Halloween because it’s not my favorite holiday. This year, I used a lot of stuff I already had on hand. But I added a few things I got last year after Halloween, like the gold posable skeleton. 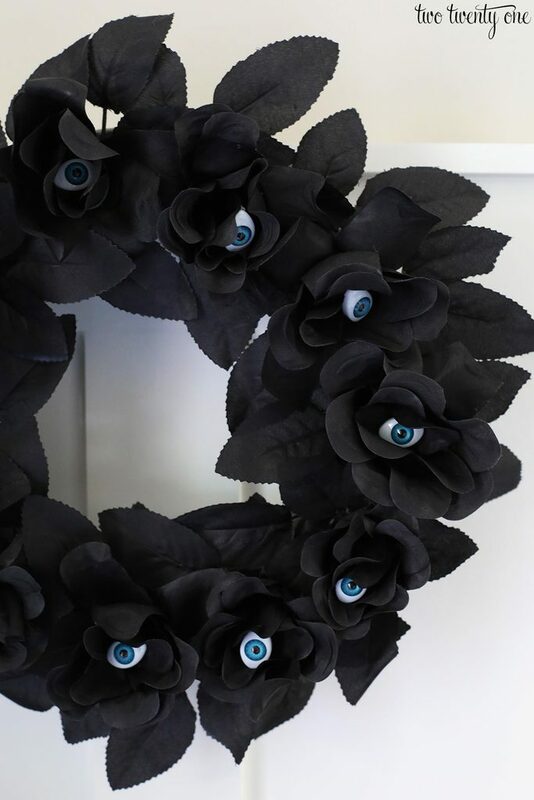 I made the black flower eyeball wreath a couple years ago. Instead of putting our wedding photo away, I put some fake black spider web on it. 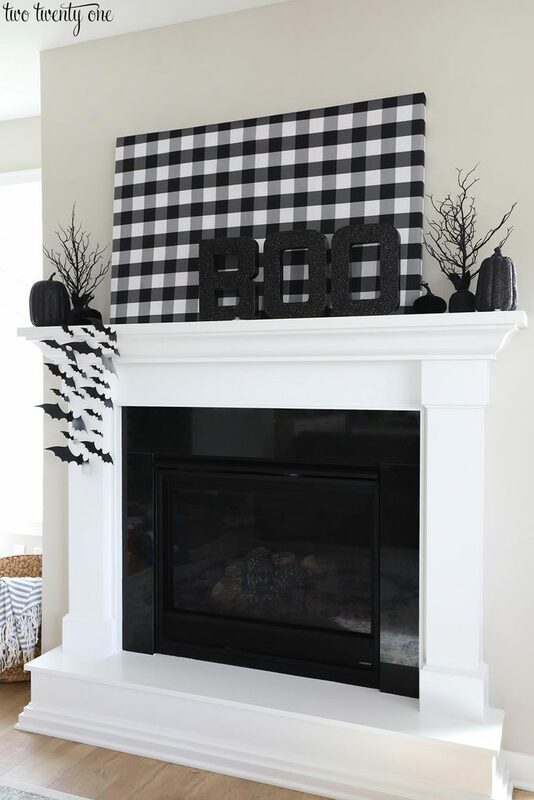 The felt ball garland is discontinued at Paper Source, but you can get the same thing here. 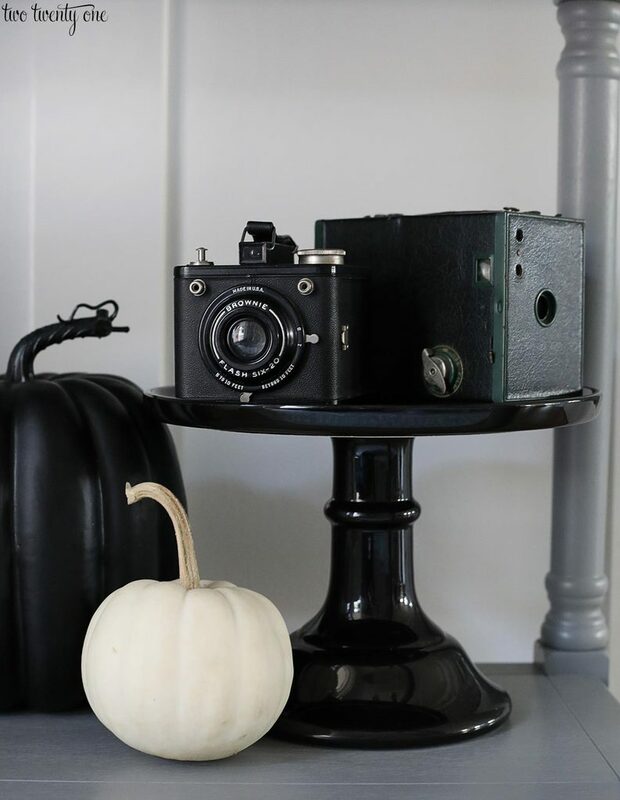 Since Halloween is such a short-lived holiday to decorate for, I try to incorporate things I already have, like my late grandma’s vintage cameras. To give them a little height, I sat them on a black cake stand from HomeGoods (here’s a similar one). 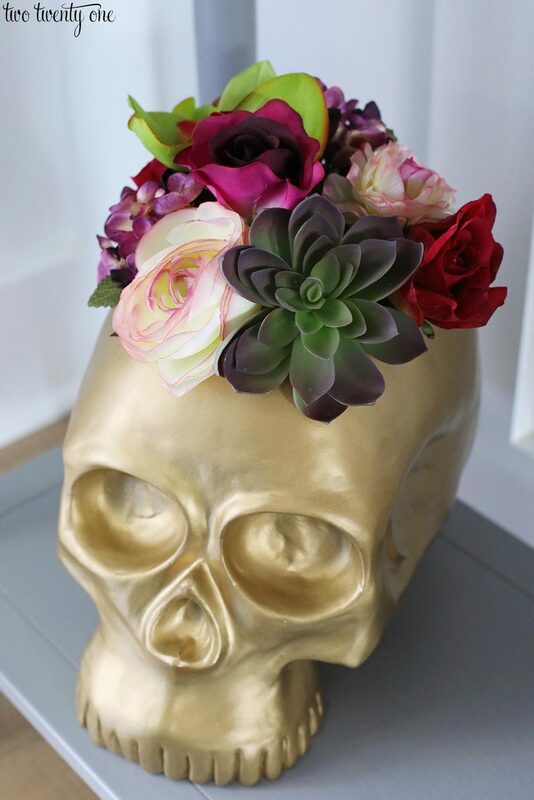 This gold skull is massive in size. I plopped in a faux bouquet of fall-toned flowers. 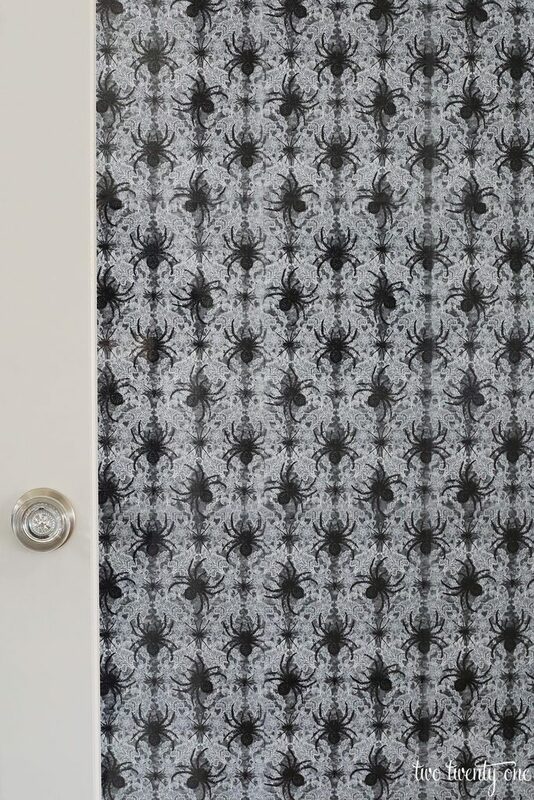 Because my home office is a perpetual hot mess, I tend to cover the French doors with wrapping paper or fabric so guests don’t have to avert their eyes. Plus, I think it’s fun to decorate the doors for holidays. I went with a lace and spider printed fabric from JoAnn Fabric this year. I cut the fabric to fit the glass and tape it onto the door with Scotch tape. Painters tape will work on gift wrap, but it won’t work on fabric. I went with a black and white theme for the fireplace this year. I reused the black BOO glitter letters I made 6 years ago and the canvas I used for last year’s Christmas mantel. You may remember it was covered with red and white buffalo check fabric. That fabric is actually still on the canvas. I secured a layer of muslin on top to mask the red and white fabric, and then glued the black and white buffalo check fabric on top. I’m pretty sure I deserve 10 bonus points for my reuse game. The glittered pumpkin has been around for years. I scored the tree and velvet pumpkin from the Target dollar spot last year. The bats are new, and I love them. They’re inexpensive, easy to put up, and don’t take up much space in terms of storing them. 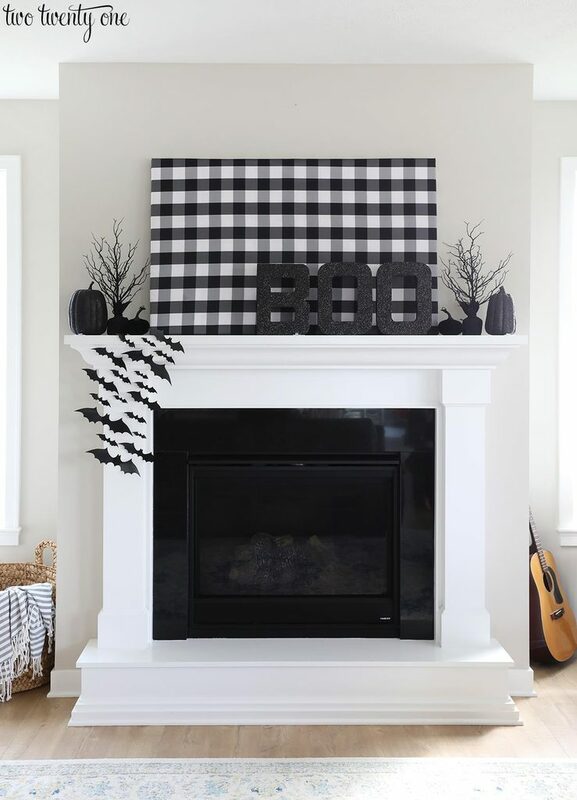 I’m not a huge fan of using black in my home decor, but I’m really digging this black and white mantel. Looking for more Halloween inspiration? 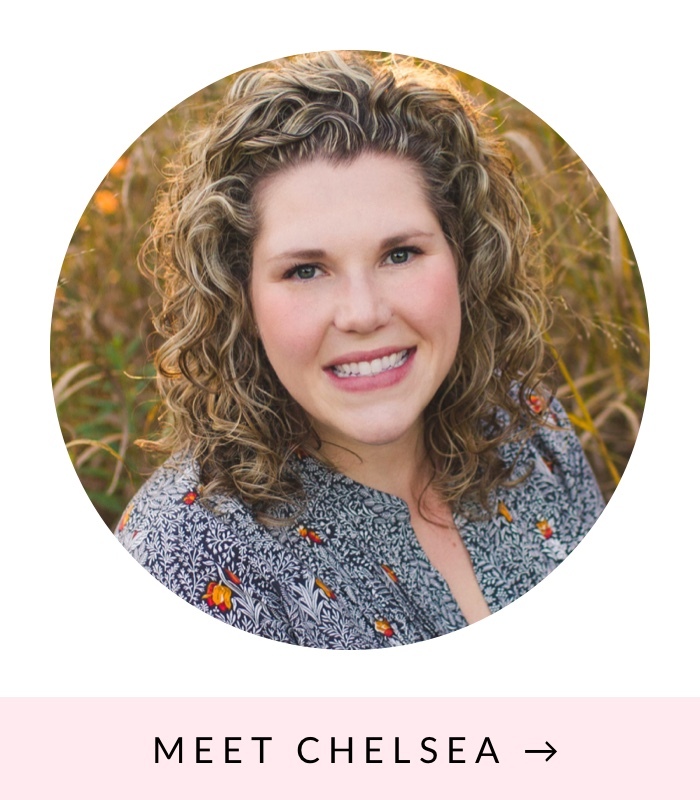 Continue the tour, and head over to Pink Peppermint Design to see what Tammy cooked up! Love, love, LOVE your mantel! 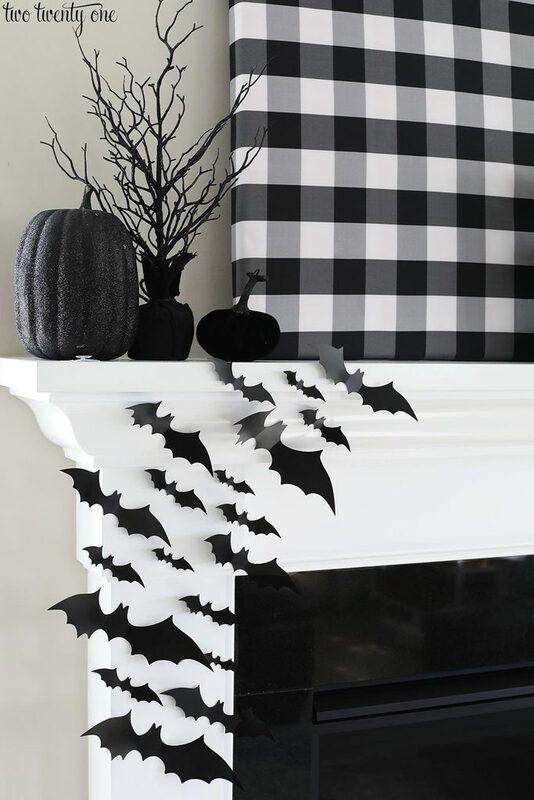 I LOVE the mantel – those bats are fantastic. You totally deserve 10 bonus point for your use of fabric! I adore the eye wreath as well. This tour is simply spooktacular! Oh my word how fun. I LOVE your brass skeleton. What a fun piece is that.